NOTE: Be careful with salt substitutes and “reduced sodium” foods, as many salt substitutes are high in potassium. Potassium is a mineral found in almost all foods. Our bodies require a certain level of potassium to make the muscles work, but during dialysis, levels of potassium need to be monitored very closely. Having too much or too little potassium can lead to muscle cramps, atypical heartbeat and muscle weakness. A nutritionist can help figure out how much potassium is right for an individual. While protein is an important nutrient, when the kidneys are not performing correctly, surplus protein starts to develop in the blood. People with kidney disease need to consume no more protein than needed by the body. 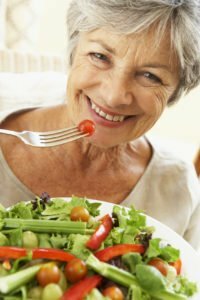 When treatment is started early, a diet low in protein and a balanced formula of essential amino acids at every meal has shown to delay the time to dialysis and perhaps reverse some kidney issues. Those with kidney disease may have a need for vitamin supplements to help prevent some frequent side effects of kidney failure including bone disease or anemia, but these should only be taken as advised by a doctor. At Hired Hands Homecare, we’re helping seniors throughout the Tri-Valley area of California to manage kidney disease, through our in-home care services which include careful meal planning and preparation services, assistance with following doctors’ orders, and providing the friendly companionship that lifts up spirits and brings warmth and joy into the home. Contact us online or call us at (866) 940-4343 to learn more about our Tri Valley home care services.